Hello! 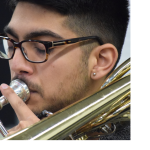 My name’s Inayat Kassam and I’m a recent graduate from Humber College with my Bachelors of Music in Trombone. The style of music I play most often is generally pop music but I have been trained in jazz and also play quite a bit of classical music from time to time. I do have a focus on music production as well and like to approach playing from a perspective of a modern studio musician so I hope this will give a unique perspective to your playing.